On a trip to George Cleverley the other week I had a chance to tour the workroom and see the last making, as well as some making in progress and the storage of the various lasts still in use. It struck me immediately how incongruous it felt to be on the first floor of a smart arcade in the West End, looking down on wealth managers strutting in their suits, and yet be surrounded by wood, sawdust and tools. Many British manufacturers proudly say that their products are made on these shores. Those on Savile Row and a very small number on Jermyn Street are also proud that construction is done on the premises. But often that work is done in basements, or otherwise tucked away from the customers and the outside. It is quite different to look out of the windows of The Royal Arcade and see potential customers browsing the shops. The manual nature of the work in a shoemaker’s adds to the incongruity. Tailoring is less physical work, and can quite easily be done in a suit or shirtsleeves. You do also occasionally see seamstresses at work in the windows of tailors (often those that advertise alteration services) so it is a more regular sight. But shoemaking involves dust and aprons, real physical exertion as the leather is stretched and nailed over a last – or a wooden block is whittled down. Both were going on at Cleverley when I visited, and the experience conjures up what traditional English workshops were like back in the days when Cleverley was founded. Elsewhere the biggest object of interest was the record book of Anthony Cleverley, showing all the bespoke pieces that he made for his aristocratic customers down the years. When the business was relaunched by George Cleverley & Co recently, they weren’t even aware of this book’s existence until old customers started mentioning it. A bit of research located the book and its owner, who passed it on. In its day the book was rather famous, with people eager to see what others had commissioned and be inspired by those ideas. 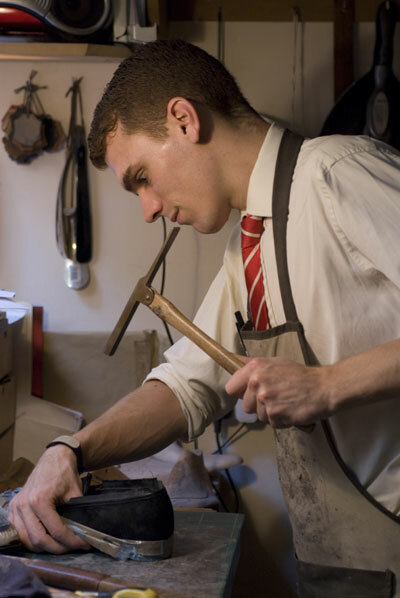 For those looking to commission a new pair from Cleverley’s, and who like the Anthony Cleverley shape (slightly longer, more chiselled and with a squarer toe), it equally provides a wealth of ideas – as well as showing the royalty or celebrity that you can mimic. I recommend popping in and asking to see it some time, as well as the original Anthony Cleverley shoe they have on display – which is so small, neat and lightweight it feels almost like a child’s shoe. You can follow the discussion on A real workshop and Anthony’s book by entering your email address in the box below. You will then receive an email every time a new comment is added. These will also contain a link to a page where you can stop the alerts, and remove all of your related data from the site. Great post. I love to see the inside of workrooms and how a product is made! Thanks Permanent Style! Dear Simon , I am wearing only bespoke for 15 years already. There is no way back))). And I don’t see any loses then jacket is undone ))).